This oil-free apple and honey granola recipe is simple to make and delicious to eat. It is perfect for the High Holidays. Normally, we save all of our symbolic Jewish holiday food for our evening meal but there is no rule that says we cannot enjoy apples and honey for breakfast too. Here is a baked apple and pumpkin couscous recipe for Rosh Hashanah. Enjoy with plant based milks for breakfast, with plant based yogurt, or as a topping on sorbet or as a snack. The plant based milk that we use is this kosher rice milk. I know that there are a lot of granola and cereals available at the grocery store and it may feel pointless to make at home. The reason I make apple and honey granola from scratch is to have a good tasting morning cereal that is not filled with tons of sugar, oil and too many nuts. 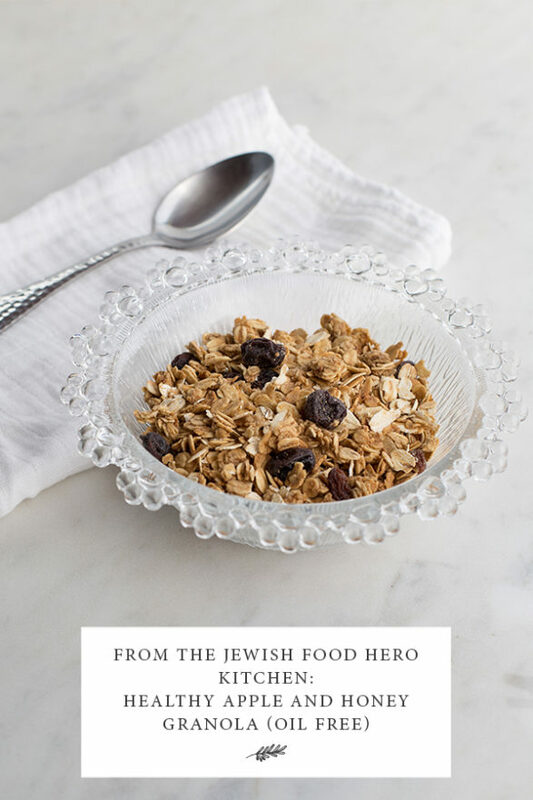 When I do not have time to make my own granola I buy this healthy kosher pareve gluten free cereal from one of my favorite brands. If you are not already eating oats for breakfast a few times a week, you might want to think about adding it into your eating pattern. Eating oats it is such a simple and healthy breakfast habit. Oats are filled with essential vitamins and minerals and are a fiber rich food. Oatmeal is very filling and they can be dressed up or down to your preferences. An add in that is not in the recipe is ground flax seeds, that I simply add to the cereal every morning. If this recipe is not sweet enough for you, add a teaspoon of honey or date sugar. Place diced apple, cinnamon, vanilla, honey and tahini in a good blender and puree until smooth. Set aside. Place parchment onto two baking sheets and spray canola oil baking spray onto the parchment paper so the granola does not stick while baking. Place on one prepared baking tray. Bake for about 35-40 minutes, or until the mixture is light brown and toasty. Make sure to stir every 10-15 minutes to make sure the granola is cooking evenly (pay special attention to the granola at the edges so that is does not burn). Meanwhile, on another baking tray, place 1 cups of oats with raisins and bake 10 min or until slightly brown. Mix together in a large bowl and allow to cool for 30 min. Store in an airtight glass container in the refrigerator.